Exactly one year after the federal government’s announcement of a National Housing Strategy, and a few months away from the new homelessness strategy, Reaching Home, rolling out, this #National Housing Day sees us getting closer to realizing the right to housing. In 1998, Canadians and municipalities declared homelessness a national disaster. Two years later, November 22 was recognized as National Housing Day. And 17 years after that, Canada finally announced its first-ever National Housing Strategy on November 22, 2017. Exactly one year later and we are at a pivotal moment in history as we make important progress on ending homelessness and guaranteeing the right to housing for all. For decades, advocates have been calling for a National Housing Strategy and federal leadership on homelessness. Today, National Housing Strategy investments are starting to arrive in our communities, a legislated federal commitment to the right to housing—something few would have dreamed possible even two years ago—is expected shortly, and the new federal homelessness strategy, Reaching Home, will launch in April. We have been waiting a long time to reverse the policies and actions implemented over 30 years ago that led to Canada’s homelessness crisis today. And it looks like we’re beginning to roll back past mistakes by forging ahead with a rights-based strategy and investing in best practices and approaches to end homelessness for good. Advocates like Leilani Farha, UN Special Rapporteur on the Right to Adequate Housing, tell us how everyone can bring meaningful change through their own personal choices and actions. Check out our one-on-one interview with the internationally renowned expert on housing rights. Communities across Canada are doing the necessary and difficult work to prevent and reduce homelessness. Our 20,000 Homes Campaign is a testament to the hard work done by the 38 participating communities who have already housed 18,750 people since the campaign’s start in June 2015. The campaign’s goal is to house 20,000 of Canada’s most vulnerable homeless people and end chronic homelessness in 20 communities by July 1, 2020. By March, we expect at least 14 communities will have quality real-time data on chronic homelessness, 10 communities will have coordinated access systems and five communities will be reducing chronic homelessness. National Housing Day 2018 is our most hopeful yet. We remain cautiously optimistic that our leaders and communities are becoming part of the solution to the homelessness crisis. Reaching Home represents the most significant change in federal homelessness programming since the introduction of the National Homelessness Initiative in 1999. In addition to the previously announced doubling of federal homelessness investments under the National Housing Strategy, Reaching Home introduces some major innovations in the delivery of homelessness and social policy in Canada as a data driven, performance-based program. However, Reaching Home removes the previous 65% Housing First investment target and puts the onus on communities to spend the money where they will achieve the greatest impact. Housing First is essential to preventing and reducing chronic homelessness. To build momentum for Housing First across Canada, our Training and Technical Assistance program provides training to support the development of a highly skilled Housing First workforce. It’s mobilizing communities to take action by supporting them with training workshops and seminars to build high performing Housing First programs. How do we know Housing First is effective? Just ask Finland—it’s the only European country to effectively reduce and nearly eradicate its homelessness crisis by prioritizing an aggressive Housing First approach. We speak to international Housing First expert Juha Kaakinen, CEO of Finland-based Y-Foundation, which is the country’s largest housing NGO. This National Housing Day, let’s show the world that an end to homelessness is not only possible, it’s within reach. 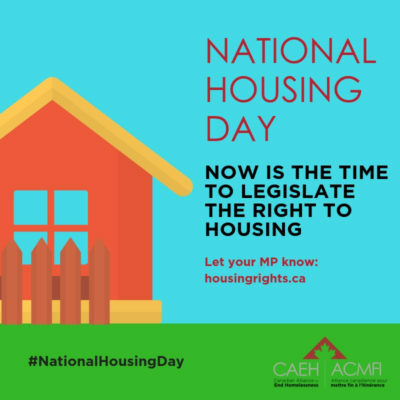 By National Housing Day 2019, will Canada have a legislated right to housing? 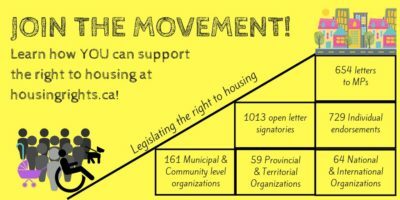 In August, the Alliance joined 170 organizations and individuals in signing an open letter to Prime Minister Trudeau urging the Prime Minister to fulfil his commitment to the right to housing by enshrining that right in legislation. Over 1,000 individuals and organizations have now signed the open letter! Let’s let policy makers know just how many of us are watching to ensure legislation does not merely co-opt the language of the right to housing, but meaningfully puts it in action! Join our call to legislate the right to housing by clicking here.